Frantic Stamper is pleased to announce our 2017 Design Team! We want to congratulate those who will join our team in the next year, and thank all of the applicants. We hope that those who were not selected this time will continue to follow Frantic Stamper on social media and will apply again on our next design team call. We had so many very talented people apply, and there was only so much room on the team. It was truly hard to choose! We hope you will help us to welcome the new and returning members of the World's Greatest Design Team! Please join us, too, in thanking departing members Janine Tinklenberg, Alanna Moses, and Becky Carafa. We will miss them, but we thank them for all they have done for the team, and we wish them all the very best! 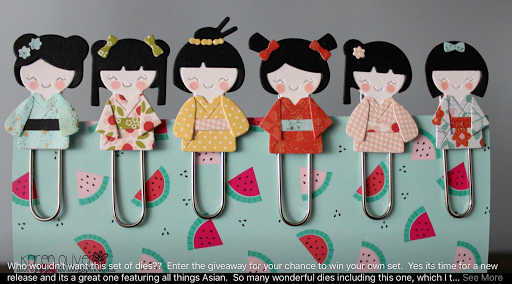 on Karen Oliver's post of the super cute paper clips with a variety of Kokeshi. Congratulations, Shari! 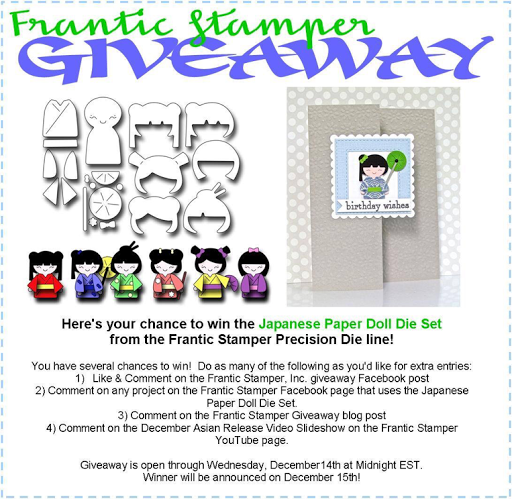 Please contact Fran with your address so we can get your die set on its way to you. Once again the Frantic Stamper Design Team has outdone itself, producing beautiful cards using Frantic Stamper's newest die and stamp release, Visions of the East. Please take a few minutes to view the release video. We think you will be as enthralled as we are! In addition to announcing the release, we are happy to share that we are having a giveaway of a die we think will be extremely popular, our Kokeshi Japanese Doll. Be sure to play along before December 14! Lastly, we want to remind you of our Design Team Call. The call closes on December 20.